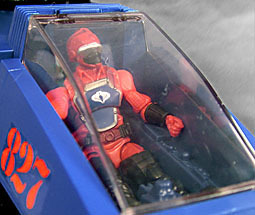 When the Target-exclusive HISS tank was released last year, it included the first new G3 character, the Cobra driver. And that was nice and all, but there was one small problem: there were already guys designed specifically to drive the HISS. What, were they on strike that week? Cobra H.I.S.S. drivers are selected from the best and most evil of the Cobra organization's thousands of yearly recruits. Each is chosen for his physical strength and total dedication to evil! HISS drivers are graduates of Cobra Battle School, Advanced Weapons Systems Training. Qualified Experts: Cobra assault vehicles and helicopters, and knowledge of all NATO and GI Joe weapons. The HISS Driver is a fairly obscure character, it's true. He never really appeared on the cartoon, since the tanks were driven by generic Cobra soldiers. The HISS was so often sold without any included figure (in various multi-packs and mailaway offers) the odds are most kids never even saw the driver, let alone owned one. But while he wasn't included with the updated version of his titular vehicle, he did get a single-carded release, something he'd never had before. Generation 3 continues to break new ground! Hasbro has so far done an excellent job of reusing their molds to make as many different figures as possible. There are a few exceptions, of course - Major Bludd springs to mind - but the HISS Driver is not one of them. He shares his torso and arms with Grand Slam (and, by extension, Flash), but the armored pad on his chest is smooth, rather than textured. It's not exactly true to the original release, but it's certainly better. The legs are new, since no other character wears the same kind of go-go boots. Seriously, what is up with those? Why does a guy driving the tank need thigh-high armored boots? The HISS Driver's head is new, as well, and fairly distinctive. His uniform apparently includes a full-head helmet with a serpentine crest running back the center, silver goggles, and a black facemask underneath. The helmet I can understand: even real tank crews wear helmets, because the ride is anything but gentle. A rocket lands next to your tread, and you're going to be jostled about at the very least. Thus, protection is a must. But why the ski mask underneath? These guys were pretty much invisible to being with, so who's going to recognize one of them out in the real world? Since the HISS Driver is sold on a solo card for about $7, he doesn't come with his HISS Tank. 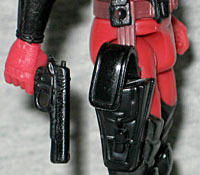 He does, however, have a pistol that fits in the holster on his right leg. That's not something the G1 version had, so why include it here? Plus, the design of the holster is all screwed up: it's sculpted with the flap closed, but then it has a second, separate flap that actually does come down over the side. Huh? It's also one of the biggest pieces any of the new Joes have had, so it gets a bit in the way when you do try to put this guy in the cockpit of a HISS. The HISS Driver's paint is nice, with just a little bit of under-coverage on the goggles and the top of the boots. His red leans toward the magenta end of the spectrum, so it doesn't stab your eyes when you look at him. 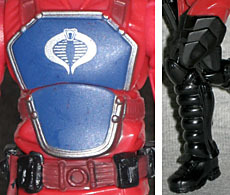 The blue on his chest is similarly understated, and though I would have liked his silver Cobra symbol to be larger, that's a chronic problem with the G3 Joes - no one's symbol has been big enough. According to the grades listed on the old filecards, the HISS Driver was actually the highest-ranking member of Cobra - he's O5 (Liuetenant Colonel), so apparently he could even boss around the Cobra Officers. Maybe that's why we never saw them on the cartoon: they made other people do their work for them. In any case, this is yet another good GI Joe toy, and almost a must-have if you've bought any of the updated HISS tanks.